Otto Von Bismark is renowned to have said that people who respect the law and like sausage should never watch either being made. After reading Sean Howe’s Marvel Comics: The Untold Story, I think we can add comics to that list. I’m fairly familiar with comics history. I’m a fan of the subject, and was around for a number of sequences outlined in this history. But Howe’s book gathers the entire history of Marvel for one engaging ride. Face front, true believers, and find out what really happened in the Mighty Marverl Bullpen of yesteryear. The one consistent element of the history is, of course, Stan ‘The Man’ Lee. He’s most notable by his absence through much of the book. Even from the beginning, he seems to want out of the comics industry to get into cinema or some other brand of culture. He’s spent way more time trying to launch a west coast Marvel cinema than he spent making comics. Stan’s ego shines bright through the narrative. He’s spent a lifetime being rewarded for just being Stan, while his collaborators have been brushed aside. There’s often mention of various staff members leaving Marvel because of a lack of recognition and going off to various enterprises such as competing companies. The history of Marvel is an interesting thing. What we know of classic bullpen days are revealed to be as much a fabrication as any X-Men or Spider-man story. The energy of the place was even higher than we were told, but the camaraderie was strained at times. The biggest surprise was learning about how little editorial control there was in the early days. Writers did double duty over their own books. It wasn’t until Jim Shooter (who will be no less controversial after this book than he was before) that editors began to have control over the creative staffs who worked on the books. The book is organized into 5 parts. Creations and Myths is the earliest days of Marvel, including the Atlas and Timely periods and the rebirth of Marvel comics under Stan Lee’s guidance. The Next Generation outlines the bronze age of the 70s, and Trouble Shooter covers the period during which Jim Shooter was Editor in Chief. My favourite anecdote covered in this section is that prior to revamping their universe with Crisis On Infinite Earths, DC had considered cancelling all their comics and just selling lunchboxes and underoos. They had contacted Marvel to discuss licensing their most popular books to Marvel. This plan was only scuttled by a lawsuit launched against Marvel by First Comics alleging that they had a monopoly on comics publishing. A lot of these stories can be found on Jim Shooter’s blog (www.jimshooter.com), although more angled towards big Jim’s POV. I wonder how much of that he started putting up to have his side of the stories told when he learned about Howe’s book? The section entitled Boom and Bust was probably my favourite, because I just like watching train wrecks. The period it covers was one I’ve got no emotional investment in; the 90s were a period where I steered clear of Marvel’s product. It’s got a great deal of dramatic tension, as we see the company being torn asunder by the actions of its new corporate masters, Perelman and Icahn. The effects the ever rising bottom line had on the company are wince inducing. These include a series of bone-headed maneuvers including purchasing and going exclusive with Hero’s World (which pretty much guaranteed that Diamond would end up the only distributor left in the industry) and purchasing a variety of trading card companies after the Trading Card market had imploded. The Clone Saga story goes from a bloated monstrosity that nearly crippled Marvel’s biggest character to something that went from a possibly mis-handled story to something botched on an epic level by editorial meddling. The hot talents of the period who would leave Marvel to form Image don’t come across very well. Howe agrees with the verdict of history that artists need some skill with narrative story-telling instead of just being skilled visual storytellers. Boom and Bust covers the same period as the book Comics Wars, published a decade ago. Howe’s take on the financial shenanigans is much more readable that that older book’s. Meanwhile, the final section, A New Marvel, covers the last decade or so, and does so very briskly. It sprints along discussing the Ultimates line, recurring issues of creator’s rights that never seem to get settled and the Quesada period before seeming to just slam into a final deadline, muttering an exhausted “And the Avengers had the biggest opening weekend in history, the end” on the second last page. 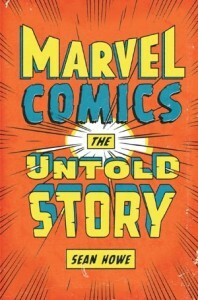 A few issues regarding pacing aside, Marvel Comics: The Untold Story is a very comprehensive look at the history of Marvel Comics. I’m sure that Howe’s book will be educational to many, and the start of arguments for many others. If you are interested in the history of comics, Howe’s story is one you need to get. Marvel Comics: The Untold Story is available via Amazon.ca, Indigo, Kobo and iBooks beginning October 9th. awesome explanation of the comic book history. Pingback: Biff Bam Pop’s Holiday Gift Guide – Win Copies of Who I Am, Adventure Time and Marvel Comics: The Untold Story « Biff Bam Pop!